Rival Palestinian factions agree to terms including new elections within six months. Hamas and Fatah have signed a landmark reconciliation pact Wednesday, having agreed upon the terms of the deal at a meeting in Gaza. The agreement addresses key issues such as presidential and parliamentary elections, the formation of a unity government, and the restructuring of the PLO and the freeing of political prisoners held by the PA in Judea-Samaria and Hamas in Gaza, according to Maan News. The deal between the Islamist Hamas and Arab-nationalist Fatah aims to put an end to a long and bloody rivalry, which boiled over seven years ago when Hamas seized control of Gaza from the Fatah-dominated Palestinian Authority. PA chairman Mahmoud Abbas is scheduled to issue a "presidential decree" announcing the dates for elections, which PA officials said would likely take place within the next six months. 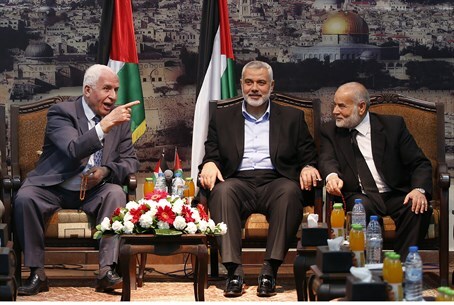 News of the deal comes shortly after representatives of Fatah and Hamas agreed to form a unity government within the "next five weeks" according to officials from the groups on Wednesday morning. However there is room to doubt whether the agreement between the rival groups of Fatah and Hamas will hold; in 2011 the two signed a reconciliation accord in Cairo which has yet to be implemented. The new moves come as the peace talks are fast approaching their April 29 deadline, with little hope they will continue beyond that and amid continued threats by the PA to dismantle its authority in Judea and Samaria. Israeli Prime Minister Binyamin Netanyahu approached news of the impending Fatah-Hamas deal by hailing it as proof that Mahmoud Abbas was not genuinely interested in peace with Israel, given Hamas' clearly stated goal of annihilating the Jewish state. "He has to choose," Netanyahu mused. "Does he want peace with Hamas or peace with Israel? You can have one but not the other. I hope he chooses peace, [but] so far he hasn't done so."